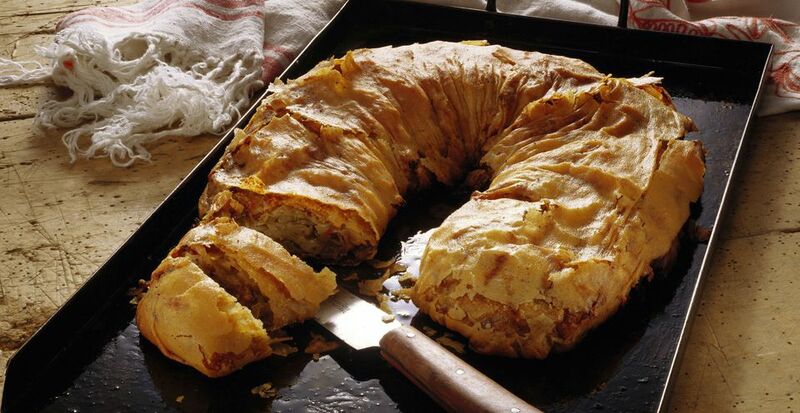 This recipe for Croatian cabbage strudel, known as strudla s kupusom or savijača s kupusom, is a savory dish made with filo dough. When abstaining from meat, it can be made with vegetable oil. Otherwise, lard or butter is used. My personal favorite way to make this is by adding bacon to the cabbage, but there are many versions including those made with kupus kiseli (whole soured heads of cabbage). Place the shredded cabbage and sliced onion in a large nonmetallic bowl and sprinkle with 1 tablespoon salt. Mix and let sit for 2 hours. Drain and squeeze out as much moisture as possible. If using oil, butter or lard, heat in a large skillet over medium heat. Add cabbage and sugar and sauté until tender. Season with salt and pepper. If using bacon, fry it in a large skillet until crisp. Remove bacon and reserve, and sauté the cabbage and sugar in the bacon fat, adding more oil or lard, if necessary. When cabbage is tender, mix in the reserved bacon and season to taste. Turn the cooked cabbage out onto a sheet pan and spread out to cool to lukewarm. Divide filo dough into 2 piles. There are usually 14 sheets of filo dough in a half-package, so work with two piles of 7 filo sheets each. Keep them covered at all times. Remaining half-package of filo dough will keep in the refrigerator for at least 2 weeks, if tightly wrapped. Heat oven to 375 degrees. Line a large baking sheet with parchment paper. Place a piece of parchment paper on a work surface. Place 1 sheet of filo dough down and brush lightly with oil, melted butter or melted lard. Top with another sheet of filo dough and brush. Continue in this manner until all 7 sheets are used. Place half the cabbage mixture in a 3-inch-wide swath on the first 1/3 of the filo dough. Fold the sides in, brushing with oil, and then roll away from you, using the parchment paper to assist. Place seam-side down on a prepared baking sheet and brush with oil, butter or lard all over. Repeat with remaining filo and filling. Bake 30 to 40 minutes or until golden. Let stand 15 minutes before cutting. Serve with plain yogurt or sour cream, if desired.